The following presentations have been created to provide valuable insight into computer aided technologies, what they are and how to successfully implement and use them for design & manufacturing. Top 10 Advantages to Using CAD-CAM Software for CNC Machining from BobCAD-CAM, Inc.
Manufacturing Participation Grant from BobCAD-CAM, Inc.
CAD/CAM CNC Software Simulation from BobCAD-CAM, Inc.
High Speed CNC Machining from BobCAD-CAM, Inc. 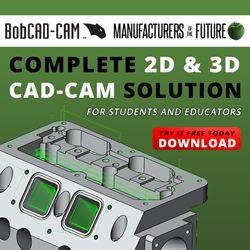 Artistic CAD-CAM Software for Custom Woodworking, CNC Routing & More from BobCAD-CAM, Inc.
CAD-CAM Rapid Prototyping & 3D Printing from BobCAD-CAM, Inc.